Asphalt Seal Coating by Kelbie Home Improvement, Inc.
Kelbie Home Improvement, Inc. has provided expert roofing services in the local area for more than 37 years, and we now offer the same professional level of service for customers looking for driveway seal coating. Asphalt seal coating adds a protective coating to your driveway to guard against harsh weather, chemicals, and every day wear and tear. When you're in the market for seal coating, call Kelbie Home Improvement, Inc. for top quality asphalt seal protection for your driveway (301) 232-3342 for a free quote. Asphalt is a naturally porous, petroleum-based product that can break down easily. Cracks or ridges allow water to penetrate and cause erosion. Gasoline, oil, antifreeze, and road salt can also cause asphalt erosion. Seal coating provides weather protection for your driveway and acts as a barrier for hazardous chemicals. Call Kelbie Home Improvement, Inc. for professional seal coating to protect your driveway. We've been seal coating driveways since 1982. A smooth driveway is a safe driveway. Cracks, frost heaves, and potholes can damage your vehicles. They can also be hazardous if your children like to roller blade, ride bicycles, or play basketball in your driveway. 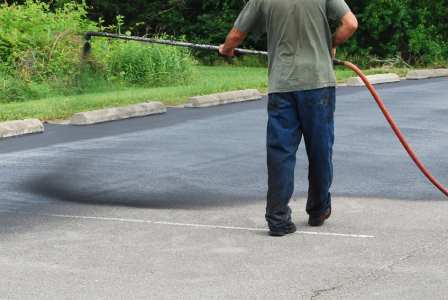 Asphalt seal coating keeps your driveway safe for your family, guests, and vehicles. Call (301) 232-3342 for a free estimate and to schedule your driveway seal coating. Weather protection for your driveway. A properly seal coated driveway is easier to maintain and is safer for your family. Kelbie Home Improvement, Inc. always applies driveway seal coating by hand to to ensure there is no over spray on your grass, walls, walkways, or garage doors. Our premium sealer is a sand slurry mixed with sand for added traction. Our professional seal coat will clean your driveway first, then pre treat oil or other chemical spills. We apply sealant to all cracks prior to applying the final seal coat layer. Call (301) 232-3342 for quality asphalt seal coating. Kelbie Home Improvement, Inc. will get the job done right.